In 1970, legendary director Orson Welles began filming what would ultimately be his final cinematic opus with a cast of luminaries that included John Huston, Peter Bogdanovich, Susan Strasberg and Welles’s partner during his later years, Oja Kodar. Beset by financial issues, the production ultimately stretched to 1976 and soon gained industry-wide notoriety, never to be completed or released. More than a thousand reels of film languished in a Paris vault until March 2017, when producers Frank Marshall (who served as a production manager on Wind during in its initial shooting) and Filip Jan Rymsza spearheaded efforts to have Welles’s vision completed more than 30 years after his death. Featuring a new score by Oscar-winning composer Michel Legrand and assembled by a technical team including Oscar- winning editor Bob Murawski, The Other Side of the Wind tells the story of famed filmmaker J.J. “Jake” Hannaford, who returns to Hollywood after years in self-exile in Europe with plans to complete work on his own innovative comeback movie. 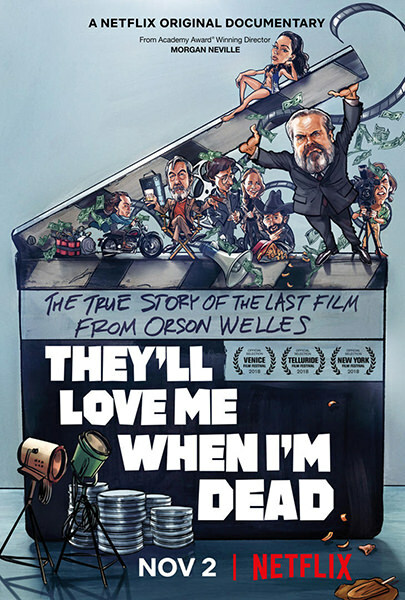 A satire of the classic studio system as well as the new establishment who were shaking things up at the time, Welles’s final film is both a fascinating time capsule of a now-distant era in moviemaking as well as the long-awaited “new” work from an indisputable master of his craft. There's also a documentary about its making, They’ll Love Me When I’m Dead. Gonna try my damndest to get a ticket to the NYFF screening. I already have a ticket! Excellent heads up though. so trying your damndest actually paid off. kudos, sir. Oooh yeah. Also got a ticket to Alex Ross Perry's Her Smell, my excitement is extreme. Some Her Smell to sell? Any other tickets? I only have Other Side of the Wind on the 29th, Her Smell on the 29th, and Her Smell on the 30th to sell. Other Side of the Wind is screening in 35mm at NYFF!!! This movie is bonkerz and I'm head over heels for its multiformat chaos... Students shooting in Super 8 <3 Feels like a spiritual sequel to F for Fake, and much of the dialogue orbits credibility, status, fraudulent intentions, mimicry as expression. So, so dense, and its reconstruction takes it past PoMo technique. Love that scene in the overloaded car. That's what indie filmmaking feels like, it's what all filmmaking feels like, I hope.